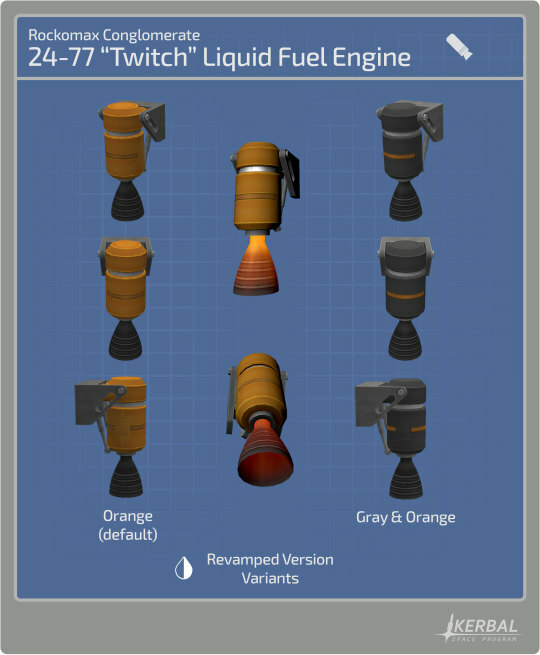 Known as an excellent engine for small landers due to its size and great thrust-to-weight ratio, the 24-77 “Twitch” Liquid Fuel Engine is getting a heavy makeover for update 1.7… That’s right, we’re working on it! 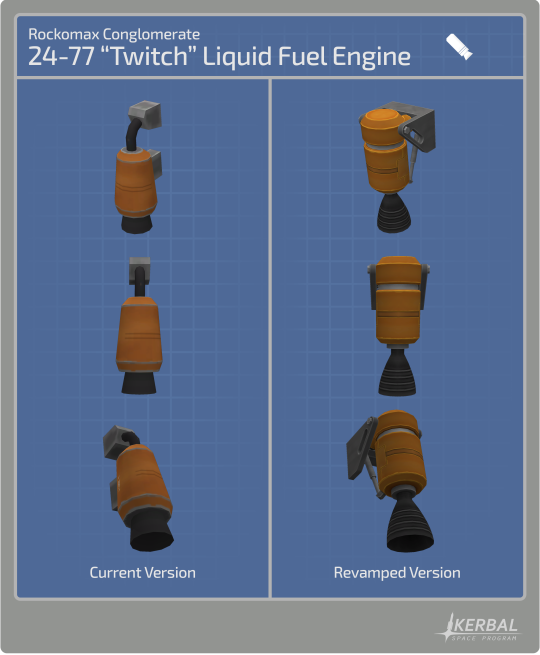 As you can see, the Twitch got its geometry and textures completely redone. And in addition to the classic orange, we are including a gray & orange variant to match with the style of your crafts. We also included an emissive texture for the throttle animation, as well as an animated gimbal that certainly will make the Twitch Engine look great when it’s in action! Does the Texel Density Machine run on the character of the older parts? If so, I think you guys over-fuelled it. It doesn't seem have a normal map (something that seems to be par for the course recently), so the recess on the middle of the cowling looks flat. I presume both textures for this part could be atlased onto something like a 512x512 texture if drawn at a sane px/m scale so adding a normal map at this size, also, is not gonna cripple anyone's PC. The shapes of the main cowling panels is a bit weird, why would you have 1 small panel in the middle of 4 outer panels (on the sides). This super confusing paneling seems to be happening on various parts now (see the fuel tanks) and I can't wrap my head around why the metal sheet paneling would ever be formed in this way... ? Apart from that... the preview makes me feel nonplussed. Its a little bland. The old one had a bit more of an organic shape whereas this one is basically just a cylinder. On that note, how is it supposed to Yaw when gimballing? It looks as if it would be constrained by the attachment points at the top of the bracket. I'm not sure how i feel about it yet. It's certainly a more detailed model than the original Twitch, but it doesn't really strike me in any particular way. It looks nice , i like how it looks more unique now. rather than just being a variant of the spark. I'm loving all these part revamps, but when are we going to get new stuff? I'd love to get more modern parts, like new engines based off the Raptor, BE-4, Merlin, RL-10, etc and more airplane parts like turboprops or helicopter rotors. Along with that some modern structural parts and structural tube adapters in various shapes and sizes. More science equipment, more solar panel types and maybe even servo's. I have a whole list of specific parts I'd love to see. A graphical update would also be a nice feature, something like EVE, but stock with the option to turn it on or off. Trying to find the Schnibble..
Actually i take it back, I've got just a few thoughts. I feel like it's missing some sort of je ne sais quoi, but of course like, that's a hard thing to pin down. A solid black variant would be nice, not just the russian olive drab. The old one's thrust transform and angle were not straight back, they were slightly angled, like 5 degrees? I'd hope that's being fixed. I don't think this is the Russian olive colour. To me it looks to be more like the black nosecone colour. "Grey and orange" is their variant codename for the russian variant, even though it's more green than grey. It probably looks black simply because it's against such a strongly colored background. another @SQUAD question...will adding a second variant somehow break an existing craft file or is the game smart enough to resolve which variant to use if no variant existed before? If I go back and look at previous Dev screenshots from actual Russian varients, the colour is way more greenish and lighter than this. I don't think we should pay much mind to the names of the varients, since they have been weird in the past. For instance, some of the adapters were called 'Black and White' when there wasn't even any black on it and the Russian varients was just called 'Orange'. Yeah, don't get me started on variant names, that's an exhausting rabbit hole of confusion at times. One i'm acutely sensitive to, for whatever reason. Hey guys, if you want to discuss my work, I've a thread for that. 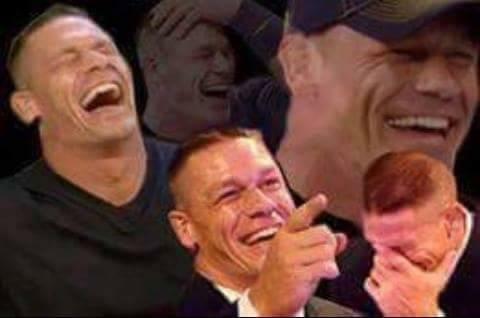 Let this be about the content Squad shows, not my interpretations of it. Aren't the hot nozzle colors wrong? 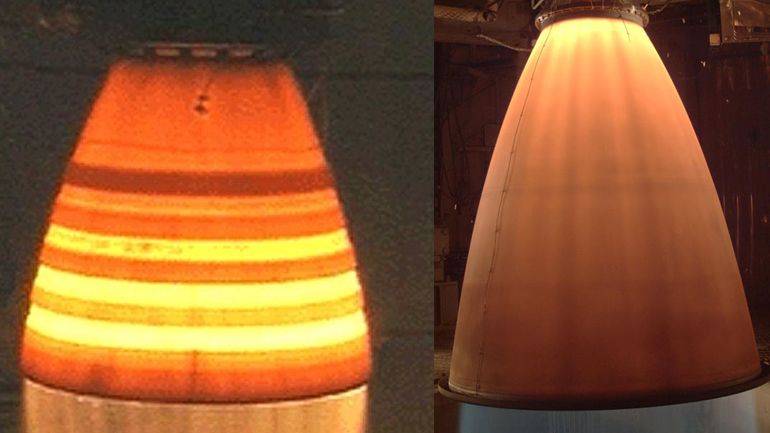 Usually it's the bell that glows, and not the combustion chamber, from videos of real rockets. Anyway, I'm glad to see this clunky thing looking better. I like the part. A nice simple replacement for a simple part. But something seems off with it, my eyes are drawn to the nozzle and I'm thinking it doesn't look right for some reason. I can't put my finger on it.